My birthday was this past month, in April. 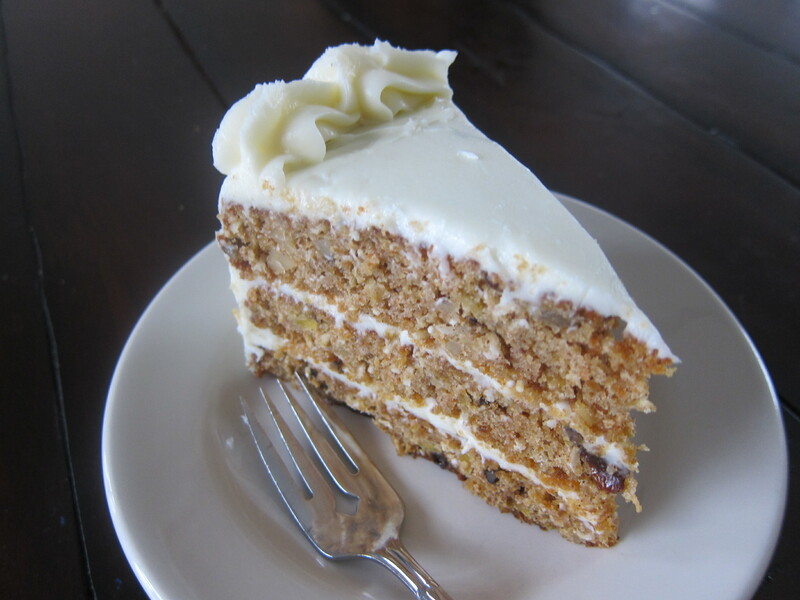 Several months leading up to my birthday I was dreaming about the carrot cake I would get to have. It has so many different textures from raisins to walnuts to pineapple, which I think is why I love it so much. And of course the cream cheese frosting brings it all together and makes it glorious! 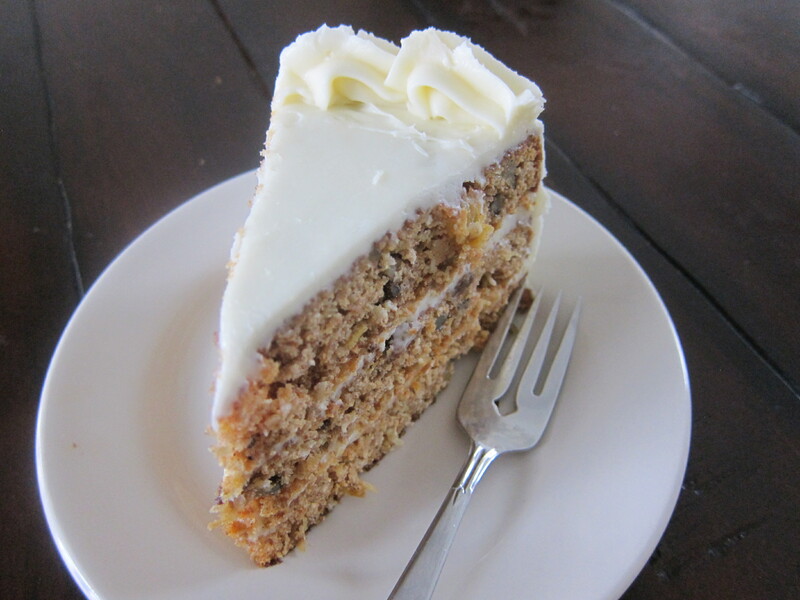 The cake itself is made with half whole wheat flour and half unbromated white flour, I use evaporated cane juice instead of your typical sugar, and coconut oil in place of vegetable oil. The frosting is not as ‘whole’ as the cake because it has powdered sugar, but I really didn’t see any other way around it. But all the other ingredients in the frosting are whole foods, and the cake has so many redeeming qualities, and it was my birthday so I think it’s totally fine :). 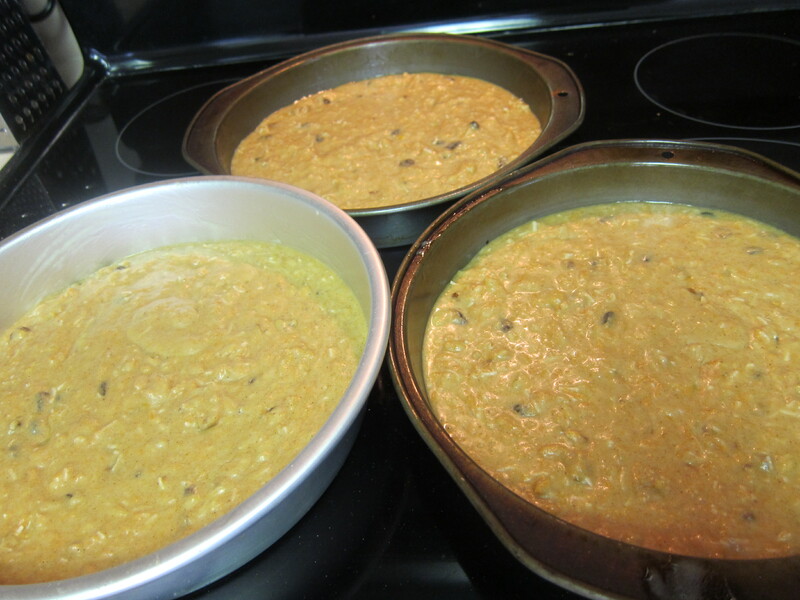 You will want to line your cake pans with parchment…if you don’t do this your cake will most likely stick to the bottom of the pan and fall apart when you try and take it out. Also, spray the pans all over the sides and bottom, with a baking spray that has flour inside, Pam with flour, is a good one. Preheat your oven to 350 degrees. Mix your liquids together in a large mixing bowl. I use my bosch. 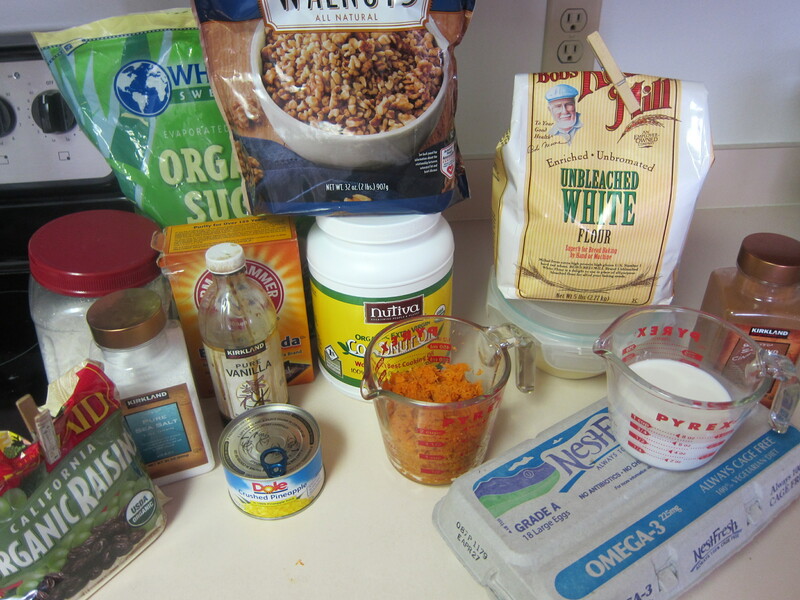 Then add the dry ingredients and mix. 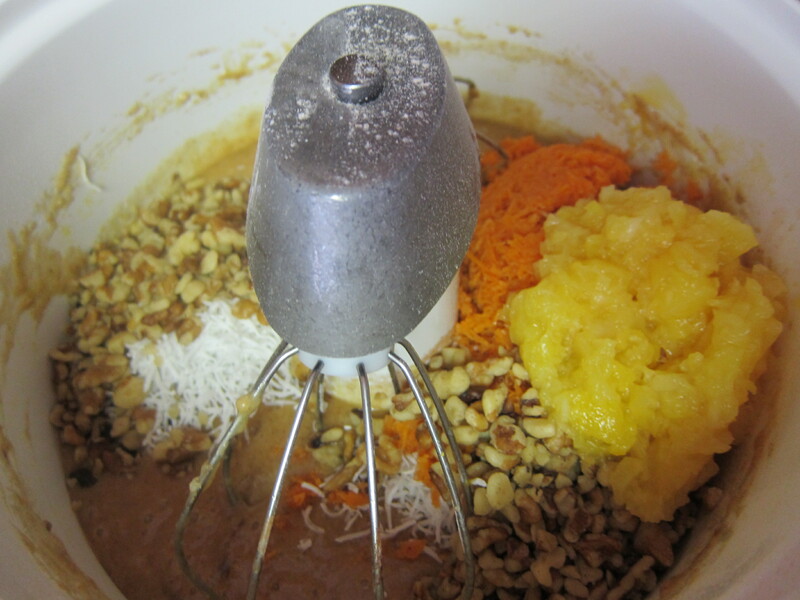 Last, add the carrots, coconut, walnuts, pineapple and raisins(optional) and fold together or if you’re using a machine like mine, just give it a couple of quick mixes. Pour the batter into your prepared pans and bake in your preheated oven for about 25-30 minutes or until a toothpick comes out clean. Once they’re out, run a knife around the edge of the pans. 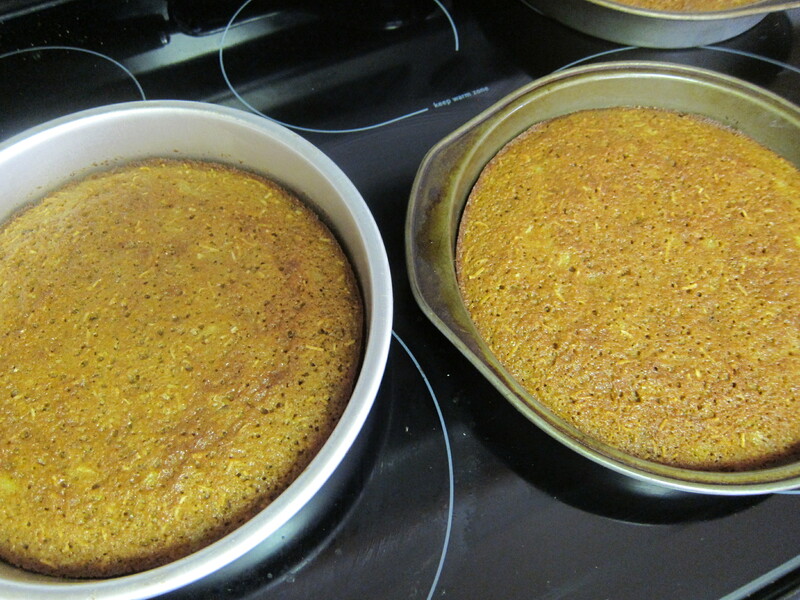 Flip the cakes onto a cooling rack, peel off the parchment, and allow them to cool completely. 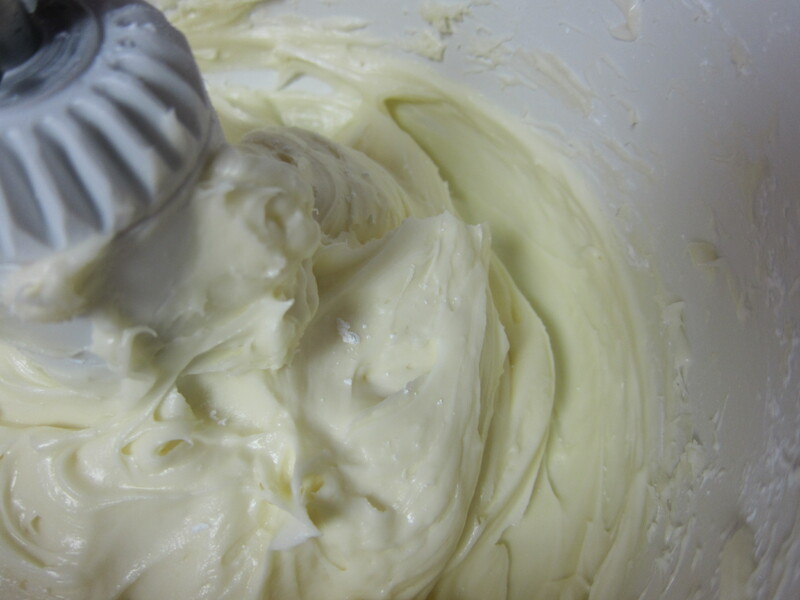 While the cakes are cooling you can mix up your frosting. Cream together butter, cream cheese and vanilla and then add the powdered sugar, a cup at a time so you don’t have a big powdery mess. Frost it all over and you’re done! 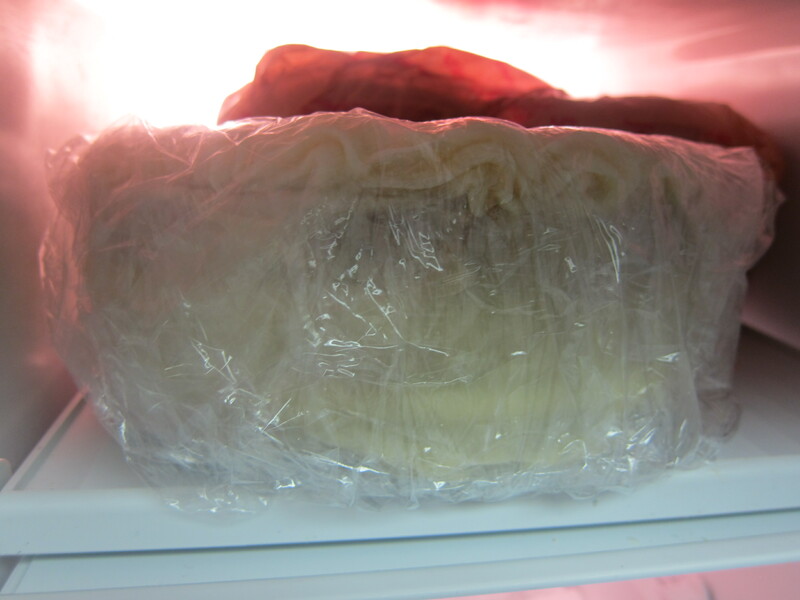 Cover it with saran wrap or in a cake container and keep in fridge. I actually like my cake best on day two. Maybe because it’s been refrigerated for awhile so the frosting firms up a bit since it’s made from cream cheese and butter, or maybe because all the flavors have had more time to combine? I’m not really sure. 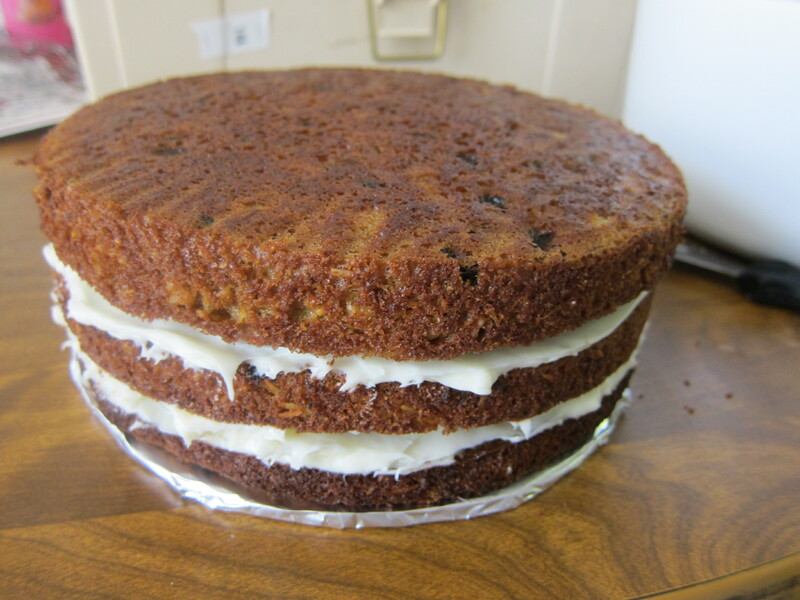 I originally made this cake the week before my birthday for bookclub with the plan to wrap up and freeze the leftovers (over half the cake) to have on my birthday. It worked out really well. 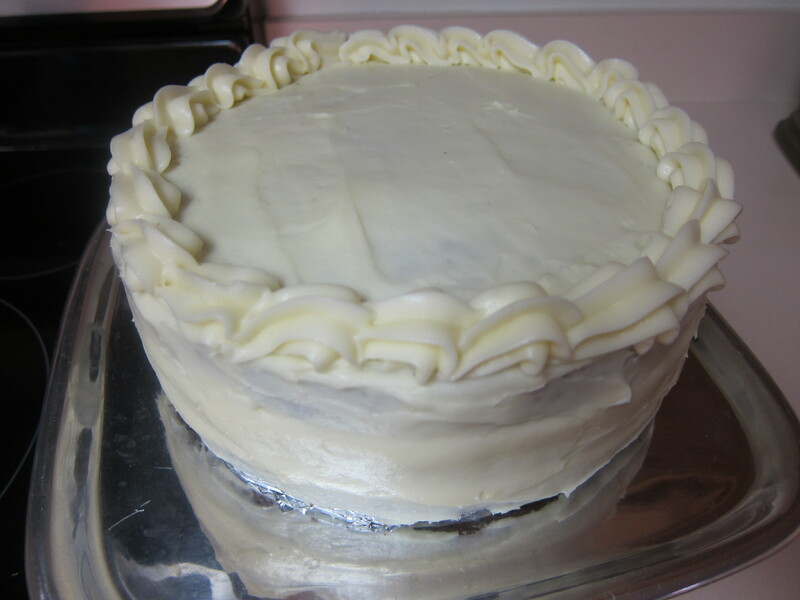 Cakes freeze very well, frosting and all. Preheat oven to 350 degrees. 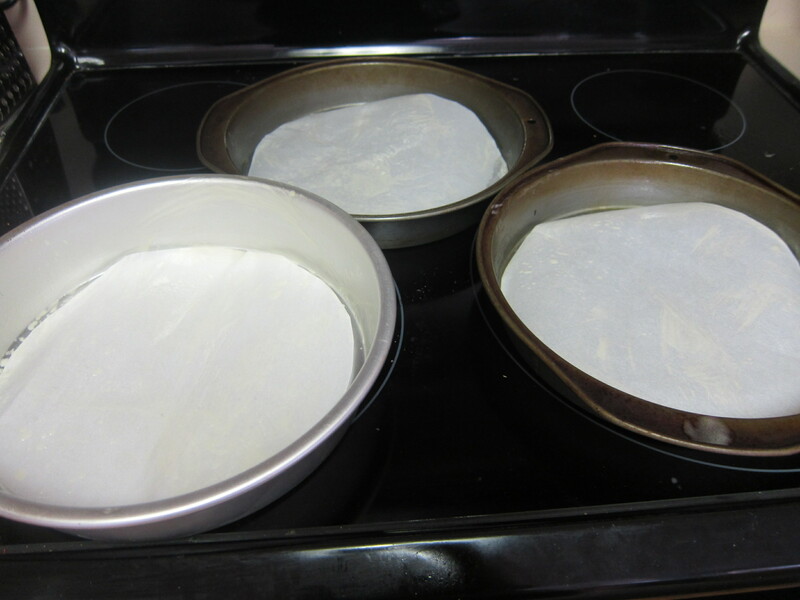 Grease and flour 3 9-inch circle cake pans with parchment paper in the bottom of each pan. In a large mixing bowl (or bosch) combine eggs, buttermilk, oil, sugar and vanilla. Mix well. Add flour, baking soda, salt and cinnamon and mix well. 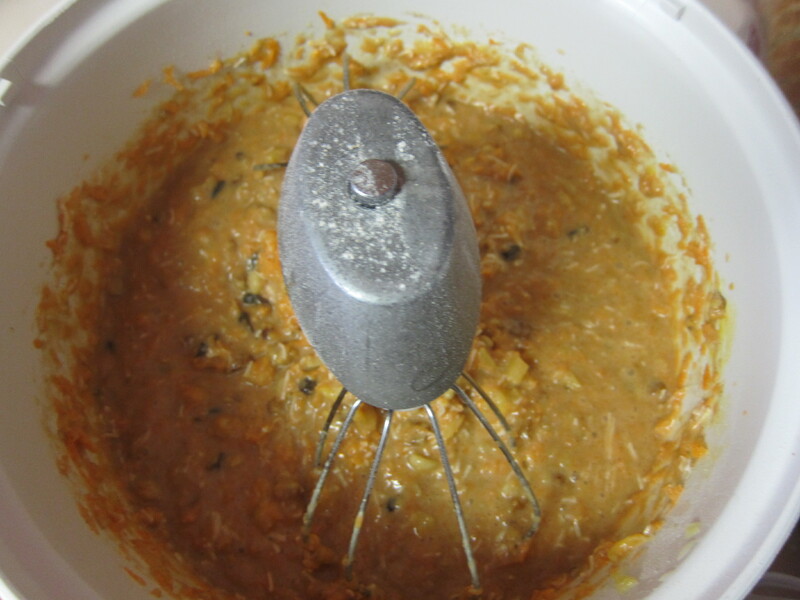 Add in carrots, coconut, walnuts, pineapple and raisins, fold in well. Pour into prepared pans and bake at 350 degrees for about 30 minutes or until toothpick inserted in middle comes out clean. 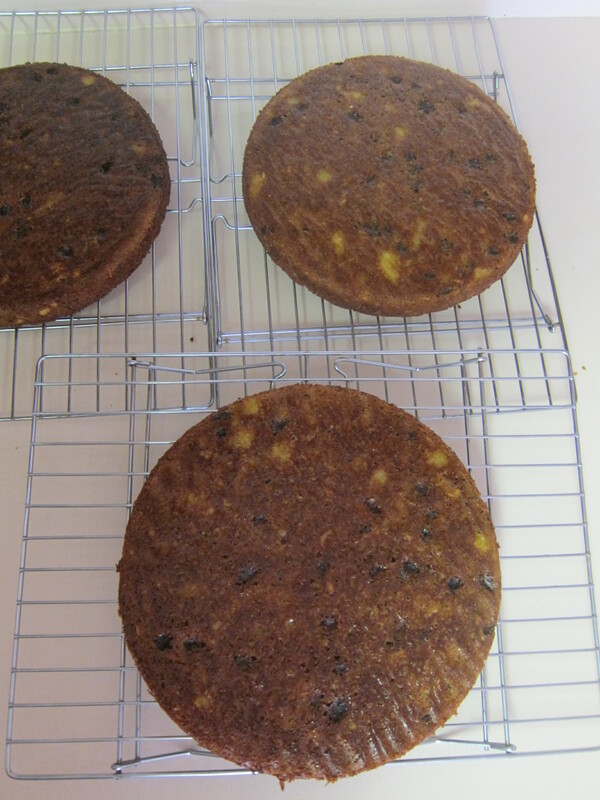 Go around the edges of the pans with a knife then turn cakes onto cooling rack, peel off parchment and allow to cool completely before frosting. 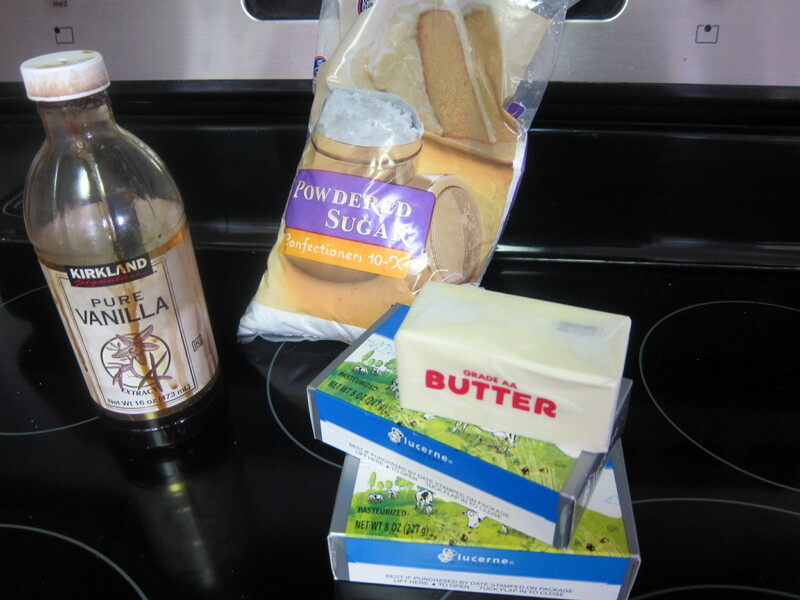 For frosting, beat cream cheese, butter and vanilla. Add powdered sugar, a cup at a time (if you add it all at once you’ll have powder flying out everywhere). Cover and refrigerate. Also, this freezes well! Just cover in a couple layers of saran wrap.